2018 marked 100 years since the end of the First World War, also known as the Great War. To commemorate this anniversary, the City invited everyone to events across the city. Watch the 2018 Old City Hall ceremony on the City’s YouTube channel. The City of Toronto’s 2018 Remembrance Day Ceremonies commemorated those who paid the ultimate sacrifice in the First World War, the Second World War, the Korean War, Peacekeeping and the Afghanistan conflict. Learn why we remember and the significance of each portion of the Civic Remembrance Day ceremony. The Province of Ontario, Community organizations and the Royal Canadian Legion also organized Remembrance Day services across the city. Canadian Armed Forces march past the South African War Memorial located at University Avenue and Queen Street West. 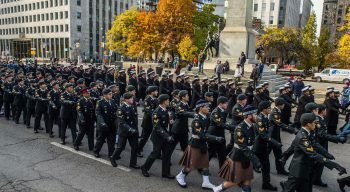 Starting at 10:10 a.m. on Sunday, November 11, 500 members of the Canadian Armed Forces paraded north on University Avenue from Union Station to symbolize the return of soldiers from the First World War. They marched from the train station as they would have done in 1918-1919. 250 serving members of the 32 Brigade arrived at 10:45 a.m. to witness the ceremony at the Old City Hall Cenotaph. The remaining 250 Canadian Armed Forces continued to march north to Queen’s Park to participate in the Provincial ceremony. Mayor Tory officially dedicated the Great War Book of Remembrance on November 7, 2018. 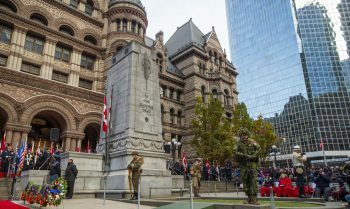 The City of Toronto identified the names of more than 3,200 people who died during the First World War and were members of Toronto-based regiments. To commemorate their sacrifice, a book named the Great War Book of Remembrance was made, which will list the names of these individuals. It was officially dedicated by Mayor John Tory on Wednesday, November 7 at City Hall. The book has 100 pages to reflect this year’s armistice centennial. 18 of the pages are blank to accommodate more names as they are identified in the years to come. The title page is calligraphed by Mark Lurz, President of Calligraphic Arts Guild of Toronto. It shows two flags and three badges. The flags are the Royal Union Flag and Red Ensign (1871-1921). The three badges include maple leaves, which would have appeared on soldiers cap badges and buttons and would have helped to identify them as Canadian soldiers. The City of Toronto has a book of the war dead from the Second World War, called the Golden Book of Remembrance. It was officially dedicated by the City on December 28, 1947, and contains the names of 3,300 servicemen and five women from Toronto. The book is available at the City of Toronto Archives (255 Spadina Rd.). Mayor John Tory joined the Lieutenant Governor of Ontario Hon. Elizabeth Dowdeswell, members of the Canadian Armed Forces and the Commonwealth Consular Corps for a special rededication ceremony on November 10, 2018, in Coronation Park (711 Lake Shore Blvd. W.). The park is an important commemorative space and is possibly the largest First World War memorial in Toronto. It is being restored to its original design as a permanent memorial to Canada and Toronto’s war effort. The first phase of this redesign was completed in November 2018. On Sunday, November 11 at sunset (4:56 p.m.) bells across Toronto rang 100 times to commemorate 100 years since the end of the First World War. This initiative, called Bells of Peace, was led by the Royal Canadian Legion in partnership with the Government of Canada. The ringing of bells symbolized the church bells that rang across Europe in 1918 for the end of the Great War. The City of Toronto rang bells at Old City Hall.